Picturing the Wreck is Dani Shapiro 's third novel. Holocaust survivor Solomon Grossman is a psychoanalyst in present-day New York and has been searching for his estranged son Daniel for decades. When Solomon sees Daniel on the national news at the site of a horrific plane crash in Los Angeles, Solomon hops directly on a plane to catch up with him before it's too late. In addition to remembering the precious memories he has left of his son, Solomon is haunted by thoughts of Katrina Volk, an ex-patient of his from thirty years ago with whom he had a sexual relationship. As Shapiro takes us elegantly and seamlessly between past and present, we learn how the events of Solomon's life have shaped the person he has ultimately become. As always, Dani Shapiro is poetic and tells a beautiful story with Picturing the Wreck , although the plot is wearisome and slow at times. However, the novel may only appear to be tiring because the story moves at Solomon's slow and languid pace, which is agonizingly parallel to his overall persona. Shapiro's narrative continuously brings readers intimately close to the protagonists, and again it's easy to imagine Solomon's surroundings and see his memories as clearly as if we were the ones who lived them. Shapiro delivers a story that allows us to see and learn exactly why Solomon has become the way he is as a result of his actions. Solomon's tale of loss is quite sad and depressing despite its revelational -- and incredibly unique -- ending. 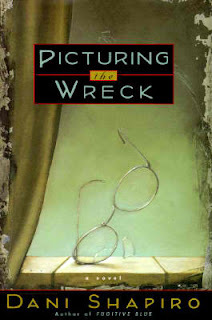 Although I wouldn't specifically recommend reading Picturing the Wreck , fans of Dani Shapiro who haven't read this novel will greatly appreciate it and her talents to candidly expose her characters to their fullest extent. No matter how melancholy Picturing the Wreck may be, Shapiro is a master at adding vibrant color to her novels, even if those colors are the sad hues of gray and blue.